We are pleased to present our fourth issue of evolution, a seasonal journal. This issue focuses on the challenge of creating unique places in a rapidly globalizing world. Moore Ruble Yudell's monograph, The Future of Place, is now available. 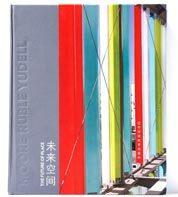 Published by Liaoning Science and Technology, the monograph is a graphic showcase of current and future projects, with introductory texts by internationally renowned architecture critic, Michael Crosbie, as well the firm's partners, John Ruble and Buzz Yudell. Please join us for the booksigning at Hennessey & Ingalls in Santa Monica on Wednesday, June 22, 2011 at 5pm. Time and space appear to be shrinking under the influence of new technologies. Travel and electronic communication are transforming our lives—our relationships to one another and to place. The culture of architecture reflects this new globalization. Aspects of this are energizing: cross-cultural understanding, communities of collaboration, extraordinary technologies. Yet there are ominous trends in this period of transition. The globalization of architecture can default into the branding of place, the erasure of cultural difference and the commodification of the environment. How can we work creatively in a manner which embraces the energy of global transformation while celebrating the differences of place and the continuities of culture? Through an international practice in a wide range of project types, Moore Ruble Yudell has sought authentic responses to the multiple dimensions of place and culture. Even as we practice globally, our work is inseparable from its site, climate, and context. We understand built context as the expression of deeper principles—timeless lessons of regional character, climatic response, and cultural identity. In each project the transformational arc of the contemporary—new programs, new technologies, new forms of community—finds its greatest relevance in engaging the specificity of place. The resulting diversity of our practice represents a range of strategies, with each project as unique as the forces that shape it, united by a commitment to humanistic place-making. In certain contexts where a highly sensitive historic language of architecture and landscape has evolved, we have explored ways of building with great respect for these traditions, reinterpreting their principles with both traditional and contemporary expression. At the University of Virginia, our South Lawn project revives the historic axis to distant mountains, which Jefferson had begun, only to have it later obstructed. The experience of the new building and landscape connects to the historic campus through classically inspired proportions and planning, yet surprises with an unfolding choreography of contemporary, light-filled places. Some historic settings have provided the opportunity to be both respectful and transformative. At UCLA, the new home for World Arts and Cultures comprises components of historic restoration, adaptively renewed spaces and flexible contemporary places such as the Kaufman Family Garden Theater. The contrasting elements interact like a jazz composition with shared rhythms and themes, but highly varied expressions. The ensemble reflects the richness of the academic program which embraces a range of art from vernacular to emerging contemporary exploration. Working across many cultures and building types has allowed us to explore evolving paradigms in place-making. At the University of Cincinnati, we collaborated with campus architects and colleagues (Morphosis, Gwathmey Siegel, Hargreaves Associates) to create a new 24/7 center of student life. The campus had recently completed a series of iconic buildings by distinguished architects (Eisenman, Gehry, Graves, Pei Cobb Freed) and felt that the next challenge was to build equally distinguished buildings but to plan them collaboratively so that the spaces between buildings and the places of community would be more important than the individual buildings. This collaborative process involved programming and masterplanning prior to building design. The result has been such a vibrant contemporary ensemble, that critics have considered it the most successful integrated piece of campus planning and design since Thomas Jefferson’s Lawn at the University of Virginia. 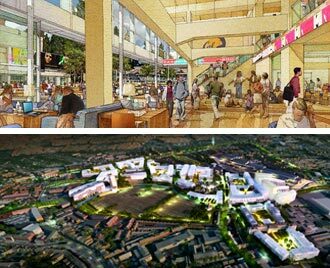 Each new project is a chance to shape places which in turn nurture community. The new town center of Camana Bay creates a vibrant pedestrian-oriented mixed-use core, based on an extrapolation from the environmental wisdom of traditional building types. Computer modeling and contemporary materials raise the performance and comfort of buildings. Outside spaces are shaped for community and environmentally tempered by the architecture and landscape, allowing a broad range of round-the-clock activity in a tropical climate. The diversity of our work is an expression of the diversity of place and culture, and of our on-going collaboration with clients and colleagues. Each work makes its contribution to existing places—respecting, enriching, and sometimes transforming—but always recognizing the defining qualities of context and setting. In collaboration with students and administrative leadership at the University of California Berkeley, Moore Ruble Yudell recieved a 2010 Honor Award for the Student Community Center from the American Institute of Architects California Council. The Santa Monica Civic Center Parking Structure received a 2010 Merit Award from the American Institute of Architects California Council. The Grangegorman Masterplan is a recipient of the prestigious Chicago Athaneum American Architecture Award. A video and exhibition panel of the project were featured as part of the accompanying Symposioum "The City and the World" in Madrid, on November 4-7, 2010.
received a Citation Award from the National Center of State Courts at the AAJ 7th International Conference of Courthouse Design and will be included in their Retrospective of Courthouse Design 2001 – 2010 to be released in November. Moore Ruble Yudell was awarded the first annual Governor’s Award for Design and Construction Excellence for the Camana Bay Town Centre in the Cayman Islands. Moore Ruble Yudell was recently selected by the Administrative Office of the Courts, to design the new Santa Barbara Courthouse. One of the largest new public buildings, the project provides an opportunity to make the new courthouse an integral part of Santa Barbara’s rich civic life. The project will begin with a site selection process. Moore Ruble Yudell has been chosen to renovate and add guestrooms to the landmark Faculty Club designed by Charles Moore and William Turnbull (Moore, Lyndon, Turnbull, Whitaker"), completed in 1968. The UCSB Faculty Club is an important architectural milestone of the 20th Century. Moore Ruble Yudell, partnering with BNIM, has been engaged to develop Phase I and II of UCLA’s new engineering complex that is dedicated to pioneering energy conservation research. The U.S. Department of State's Bureau of Overseas Buildings Operations and Bureau of Administration announced the award of a $148.8 million contract to build the new Moore Ruble Yudell designed embassy compound in Santo Domingo, Dominican Republic. The new 215,000 square feet MIT Sloan flagship building has rapidly become the vital heart of the school. It is also the greenest building on campus. It was officially dedicated on May 13, 2011. Krista Becker, AIA, and John Ruble, FAIA, participated in the AIA Design for Diplomacy briefing on Capitol Hill in Washington, D.C. They presented strategies and examples of how design, function, sustainability, security and safety standards can be met in an innovative and integrated design process. Simone Barth, Dipl. Ing. Arch and Associate held a public lecture at the Univeristy of Technology Sydney, focused on the experience and exchange of working in multiple scales and a broad range of building types from residential to city and master planning. Mario Violich with clients Emily Marthinsen and Beth Piatnitza reviewed innovative strategies for revitalizing campus community for the new UC Berkeley Student Community Center. James Mary O'Connor and client Noel O'Connor discussed DIT/HSE’s Grangegorman Masterplan and place-making methodologies for fitting a new campus into a dense urban fabric. Krista Becker, AIA, LEED AP participated in a panel on presentation and interview strategies for creating meaningful yet creative interaction between clients and expanded interdisciplinary project teams. Moore Ruble Yudell sponsored the annual AIA exhibition, 2x8, which showcases exemplary student work from architecture and design institutions throughout California. Carissa Shrock, Associate and Clay Holden, Senior Associate organized the exhibition. Victoria Lam, Director of Graphic Design designed the exhibition graphics. Ann Gray, Publisher of Balcony Media moderated a panel discussion with Buzz Yudell of Moore Ruble Yudell, Craig Hodgetts of Hodgetts + Fung Design and Architecture, and Frank Matero Professor at University of Pennsylvania Historic Preservation Program on their personal experiences and the world view on what heritage conservation means today and in the future.